Apart from the living room, the patio is where a lot of social gatherings happen in the area around your house. It’s where you and your family mingle with each other. A patio has couches or seats that readily accommodate people when they get tired of standing and walking around. And trust me, this is one of the most important places where lighting is important – so why wouldn’t you want to add ambience with some designer lamps?! Another feature that a patio has is that it has stylish tables that match with its chairs. This table can be for snacks and outdoor dinners. However, without this one, simple, yet amazing component, all the patios features won’t be noticeable by night time. Enter the realm of lighting. Lights are just one thing that can make all the features of your patio stand out to your visitors. If a person ignores the full potential of a properly installed light, then they risk their hard work in designing the patio by letting it become dull and boring. There are tons of lighting ideas around the internet. In this article, we discuss those ideas to make sure that everything beautiful in your patio gets highlighted. Not only that, we’re going to talk about the types of light bulbs that fit perfectly in your patio. It’s good to know that there are light bulbs designed specifically for the patio. Even better, these bulbs are available in different colors and styles which only ramp up the creativity in providing lights for your patio. Don’t get too excited though, as overdoing it will just create a bright and hot mess. As always, check for any faulty wiring so that you can be safer while outside. LEDs are incredibly vivid and cost efficient as they consume less power than incandescent light bulbs. Due to their low consumption of energy, LEDs are less vulnerable to overloading and heating. These light bulbs are also durable which make them perfect for stringing them together to cover large areas. These lights emit a soft and calming glow that creates an ambiance suitable for a relaxing chit chat with friends and relatives in the patio. As a child, we often look at these light bulbs with amazement due to the bright filament inside the visible glass. If you still have trouble identifying this light bulb, here’s another trip down memory lane to remind you: Remember those cartoons in the old days? Remember that scene where the main character gets an idea, and a light bulb appears above his or head? That’s the incandescent light bulb we grew up to love. Extra Tip: Avoid using LEDs and Incandescents together. The brighter, more vivid LED will compete with the soft, cozy light from the Incandescent bulb. Now that you know about the individual light bulbs you can use for your patio, check out our extensive range of designer lamps online from renowned designers like Tom Raffield. 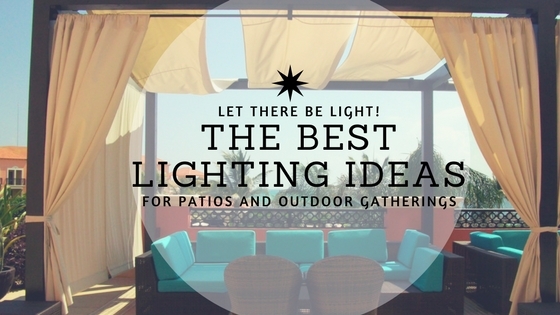 Although it may be the most cliche light to use for a patio, you can never go wrong with using them. String lights provide a cozy ambiance similar to those used in live outdoor acoustic sessions you see in youtube videos. String lights are safe to use with incandescent light bulbs since they add more to the ambiance in a particular spot. The light provided by the string lights highlight anything below them, especially when it comes to white colored centerpieces. String lights can also be for lighting pathways. Just use wires to secure or shape the string lights according to the curve or direction of the path. The Slide Cubo Outdoor is an excellent light as well as a makeshift center piece. The Slide Cubo is made for outdoors, so you don’t have to worry about harsh conditions when it does happen. The shape of the Slide Cubo is that of a cube which means you can place them on the floor, on top of a cylindrical or rectangular post that can accommodate it, or you can stack a Slide Cubo on top of another for added effect. Stack around three cubes on top of each other and place them near a wall or you can also put them in the middle of the patio floor to function as a centerpiece. There are a lot of ideas, and the only limitation is your imagination. Ever wonder why a lot of people are attracted to the moon? Well, you don’t have to stare long because the Ex Moon Lamp is designed to be like the moon. It’s gentle glow provide people with that warm feeling they get when looking into a full moon. Although you can’t stack them up together, the Ex Moon Lamp can still become a centerpiece when placed on a stand. Just make sure to secure it so that it won’t fall. Place the Moon Lamp near chairs, underneath tables, or near dark areas. The lamp’s light and the warm glow will surely attract most people towards its direction. For homes near beaches or if you just want to make your patio feel like the beach or the orient, using bamboo fixtures for torches is a good idea. Replace the torch with an incandescent lamp. Try using these lights by lining them up on a pathway towards your patio. You can also place them on the corners of porches. No matter how awesome your patio is, without proper lighting, it just won’t stand out. The right lights and fixtures highlight all the important features of your spot. Lights also upgrade the mood and feel of your patio. Patios with the right lights and designs make for the perfect spot for small outdoor gatherings with friends and family. Using lights that double as centerpieces are good ideas because they save space and look just as attractive. When it comes to providing design and lighting for your patio, the only limitation that you have is your imagination.